Lotus have added a great new incentive for new owners in the UK and mainland Europe, with 3 years (or 27,000 miles) free servicing across the Elise, Exige and Evora range on top of their existing 3 year, unlimited mileage, warranty for cars ordered between now and the end of September. With 3-year warranty and 3-year inclusive servicing offered across all 3 models in the Lotus sports car range, Lotus customers can drive away and confidently revel that from here on in, it’s pure driving enjoyment. Sports car fans with a passion for the open road can now buy a new Lotus Elise, Exige and Evora with guaranteed peace of mind. Not only does your Lotus come with 3-year warranty as standard, the famous sports car manufacturer is now offering, for a limited time only, a 3 year service package* included on all new UK and European mainland Lotus purchases. Offer is available from 1st July until end of September 2014. The perfect car for the road, a new Lotus is borne out of 65 years sports car experience. This is further enhanced by the continued pride and dedication from our team of skilled craftsmen and women who are based at Lotus, Norfolk. All Lotus’ are developed for drivers, by drivers. Performance, agility, unparalleled ride and handling provide a unique driving experience, add to this industry-leading residual values and there has never been a better time to purchase a new Lotus sports car. 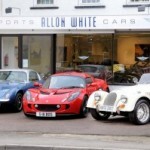 This entry was posted in Group Lotus and tagged Lotus, Servicing, Warranty. Bookmark the permalink.